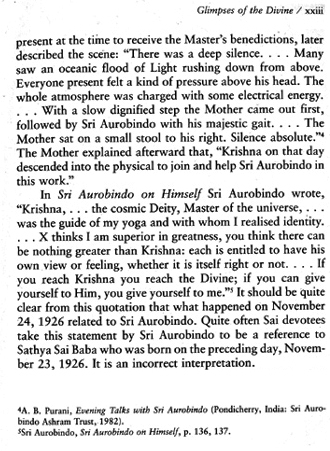 which shows that Aurobindo did NOT refer to Sathya Sai Baba when speaking of the descent of Krishna into the material world - but of himself. This is exactly the same kind of misguided fanaticism for gurus that causes many Sai devotees to state that Sathya Sai Baba was 'behind' Gorbachev's overthrow of the USSR, helped Neil Armstrong to get a footing on the moon, is the power behind Barack Obama... almost anything supposedly good one cares to name. 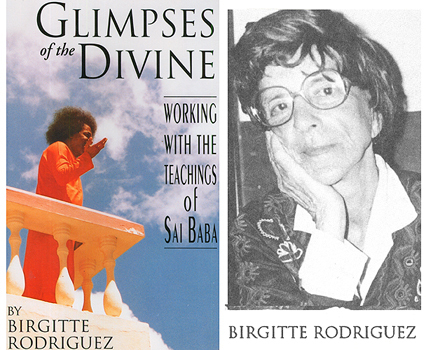 There are many instances of Rodriguez jumping to unfounded conclusion on the basis of her belief and imaginings about Sathya Sai Baba. One such example is on p. 83, a chapter 'Political Unrest': Rodriguez is convinced that Sai Baba arranges for a bus to take her to Bangalore to meet her son from Copenhagen, even though there was political unrest and vehicle are stopped and searched. This was evidently entirely in her own mind. Because traffic was suspended and a curfew was imposed in the ashram) Prashanthi Nilayam, she prayed to Sathya Sai Baba for help. Next day a bus left for Bangalore nonetheless and she was allowed to take it, though no others wanted to travel due to the supposed danger. She concluded, in true blind devotee fashion: "Baba had again demonstrated how he always protects his devotees... There are as many examples of Baba extending case and protection as there are hairs on his head." This is just a proclamation of faith masquerading as information, as usual. The fanciful metaphor shows this clearly too. Sathya Sai Baba has not protected numerous devotees who have been killed in car accidents (especially some of his students, and the billionaire's wife, Mrs. Barbara Sinclair, who died in a crash between a taxi and a lorry while on her way to the ashram when he had invited her there. Then there are those who were killed in Puttaparthi (one lady under the wish-fulfilling tree by a villager - another slashed to death by two young male villager in her new room at Prashanthi) and numerous other instances, all covered up as far as possible by Sai officials. 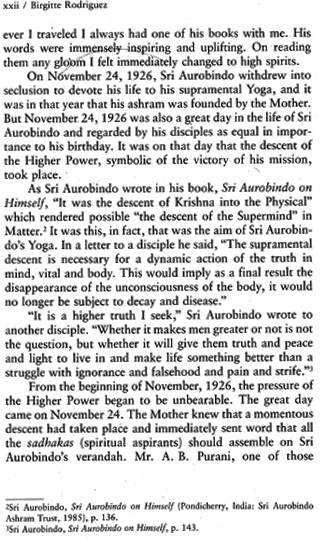 Before she arrived at the Sathya Sai Baba ashrams, Rodriguez had wandered from one guru to another, firstly a kundalini guru in the Himalyas, then Selva Raja Yesudian and Eizabeth Haitch in Switzerland, then Maharishi Mahesh yogi, then Sri Aurobindo, then Krishnamurthi and then Sathya Sai Baba. According to her book title, she (only) got "Glimpses of the Divine" but we can note how she built a large structure of fantasy upon these, as many hagiographers do.